Rakusan did not include the Fan Series in his main sequence numbering. Therefore, the original number used for each of the 36 Series prints has been modified to identify the Fan Series members of its theme. The five different fan silhouette shapes have been here assigned arbitrary numbers 1 through 5. To indicate a fan design these shape designations are added to the 36 Series number separated by a hyphen. In themes which contain duplicated fan shapes, one has been arbitrarily designated A and the other B. 105-3 indicates that this is a Fan Series design with fan shape 3 in the 105 Butterfly theme. Like all other designs in this series, 105-3 was only produced in a single print run, and few copies are currently documented. Rakusan began creating the Fan Series with a mixed set of designs whose signatures and seals suggest they were carved during the last half of 1933. Aside from a scattering of designs eventually used for later themes, the majority of these early designs were assembled into the first six themes of the series, including the 105 Butterfly theme. The 36 Series designs for all six were also completed and carved within that same short period. The 105 Butterfly theme is one of the many entirely regular themes represented by a complete fan quintet and a color woodblock print. 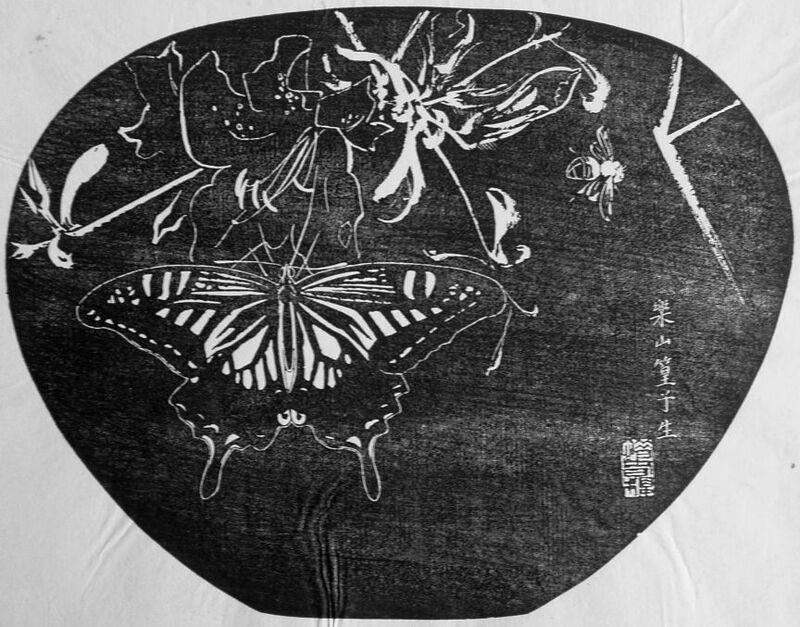 The Fan Series woodblock prints of the 105 Butterfly theme were distributed in early 1934 in installment two (of twelve). The delivery documents for installment two remain to be discovered, but its delivery month was either February, March, or April 1934, and the woodblock prints would have been printed during the same month as the publication. Butterflies and other insects often occur as subsidiary elements in Rakusan designs. However, in all of the other themes where they appear, those themes are defined by kinds of plants. The 105 Butterfly theme uniquely reverses the focus; its theme subject is defined instead by a kind of insect, and the plants are non-thematic subsidiary elements. Since 105-5 includes only butterflies, it is evident that the butterfly alone defines this theme since it is the only element common to all of these designs. The composition of 105-3 includes a large swallowtail butterfly sitting on an open flower of deciduous azalea. The azalea element also includes several buds and new leaves on at least two branches. Flying at top right is what appears to be a honeybee. The bee is shown in a larger scale to indicate it is closer to the viewer. Unlike most Rakusan bees, its wings are not blurred, but are rather captured in stop motion. Both the azalea and the bee are shown as detailed line drawings which look equally well in the ishizuri version or in the original. 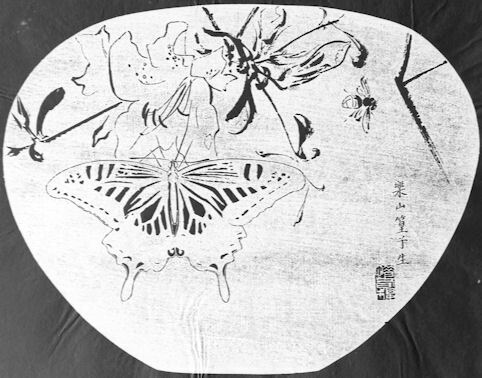 However, in the ishizuri version the color pattern of the butterfly's wings are shown as they are in life, and in the computer reversed version they look decidedly peculiar. In this and a few other early drawings Rakusan used outlining to set apart elements whose ishizuri versions were at least in part the natural ones. It is probable that the original sketch showed the butterfly in proper coloration, and the adjustments were made during carving. As a result 105-3 is one of several early designs where Rakusan appeared to struggle with his ishizuri techniques. Asian Swallowtail (Chinese Yellow Swallowtail), Papilio xuthus, (並)揚羽, (なみ)あげは, (ナミ)アゲハ, (nami-)ageha, '(common) swallowtail', is a native species in Japan. Rakusan used this species in 105-3, 105-1, and 105 in this theme; as well as in a rose design, 101-3B, (where it is non-thematic). The general name for any bee, wasp, or hornet is 蜂, はち, ハン, hachi. Here Rakusan apparently has intended to show a honeybee, 蜜蜂, みつばち, ミツバチ, mitsubachi, (lit. honey-bee). Azaleas and rhododendrons (both genus Rhododendron) are represented by an enormous number of native species, hybrids, and varieties in Japan. It is almost impossible to identify particular species solely from artworks. The general name usually applied to all azaleas is 躑躅, ツツジ, つつじ, tsutsuji. The azalea varieties shown in Rakusan's artworks are all of the deciduous group.